Today, I fell in love…..As I walked into Michael Kors, something bright caught my eye. I beelined over to the perfect bag, for me at least! Hot pink, just small enough, just big enough for my essentials, just light enough! For someone who wears mostly black and grey head to toe, including fuchsia in my outfit is my favourite way to add colour. It wakes up my wardrobe and exudes energy. 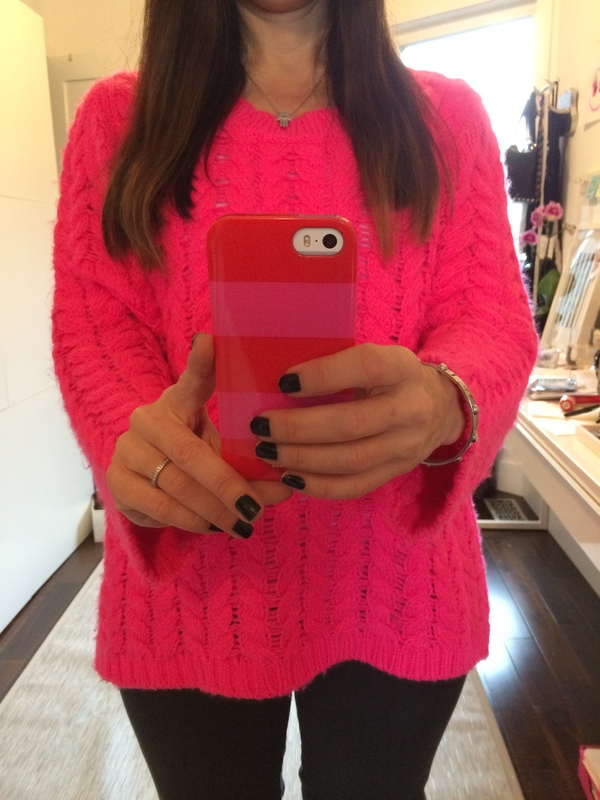 Below, a few of my favourite hot pink items; lipstick “Show Orchid” from MAC, a Joe Fresh sweater I picked up for a steal last winter, one of my Victoria Secret bras and my Kate Spade iPhone cover. I wear this Joe Fresh sweater when it’s ugly, cold and grey outside. I found it on sale for about $5.00. It’s size XL which gives me the perfect oversized sweater look. My Victoria Secret bra that no one else sees but it makes me happy!